45 character based stories from history! 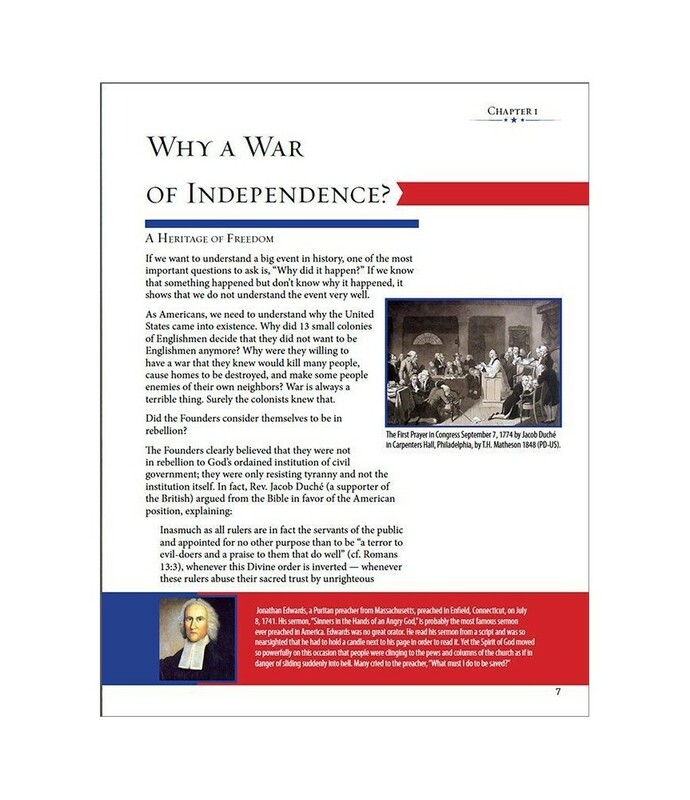 Provide your 4th grader a thorough understanding of the foundations of American independence and government! New student text by Rick and Marilyn Boyer. Can be used for 4- 6th graders. 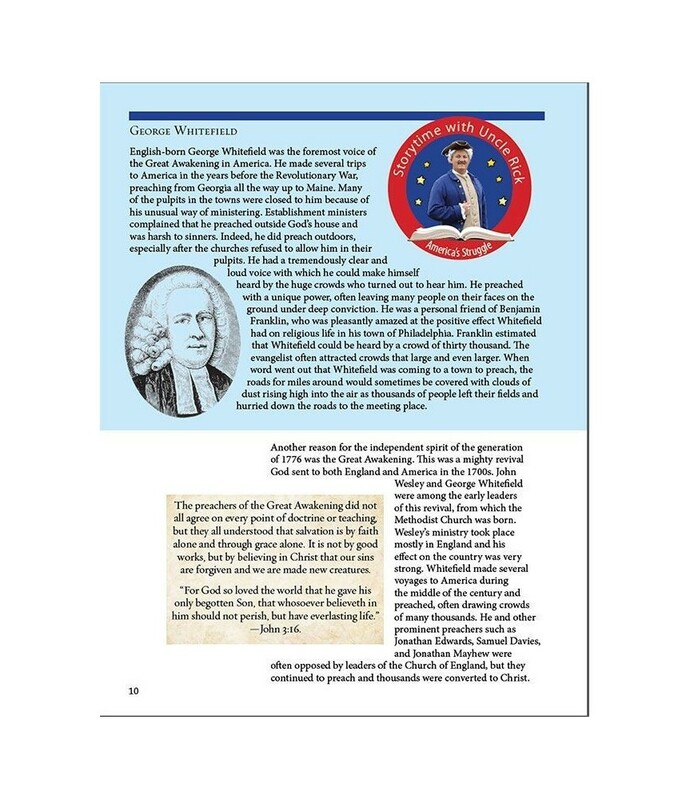 Discover in-depth character comments, explanations of providential occurrences, founder’s quotes, poetry from the time period, and more! Now more than ever, it is essential for young Americans to grow up with an understanding of what freedom means, what it cost our forefathers to win their liberty, and the power and rights preserved for every American citizen. American history is so much more than lists of names, dates, and events. It is a colorful panorama of nonstop adventure, set against a backdrop woven out of real events that happened to real people. It is the story of those people with all their hopes, fears, joys, convictions, struggles, and triumphs that makes the history of our country such a delight and inspiration for children to learn. As a graduate of the United States Military Academy at West Point and a veteran of Vietnam, I have the greatest respect and love for our Country. Unfortunately, our children are not being taught the history of our nation in most of our public and private schools. 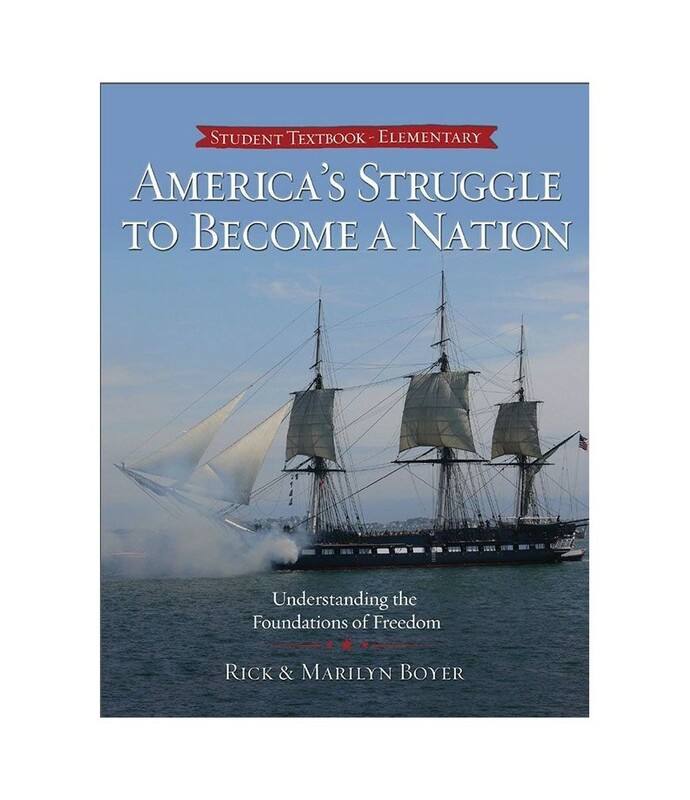 America’s Struggle to Become a Nation and The Fight for Freedom written by Rick and Marilyn Boyer together with student worksheets and biographical reference materials are an outstanding and invaluable information resource for teaching the formation and development of the United States of America. 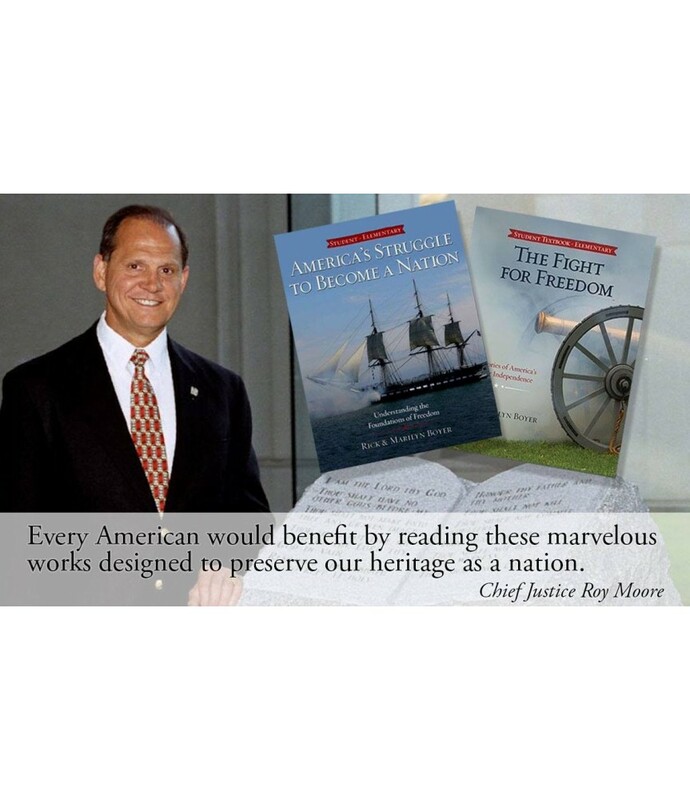 Rick and Marilyn have done a remarkable job of documenting the struggles and sacrifices of brave men and women who, “with a firm reliance on the protection of divine Providence,” risked their lives, fortunes and sacred honor to build this land we love. Every American would benefit by reading these marvelous works designed to preserve our heritage as a nation. 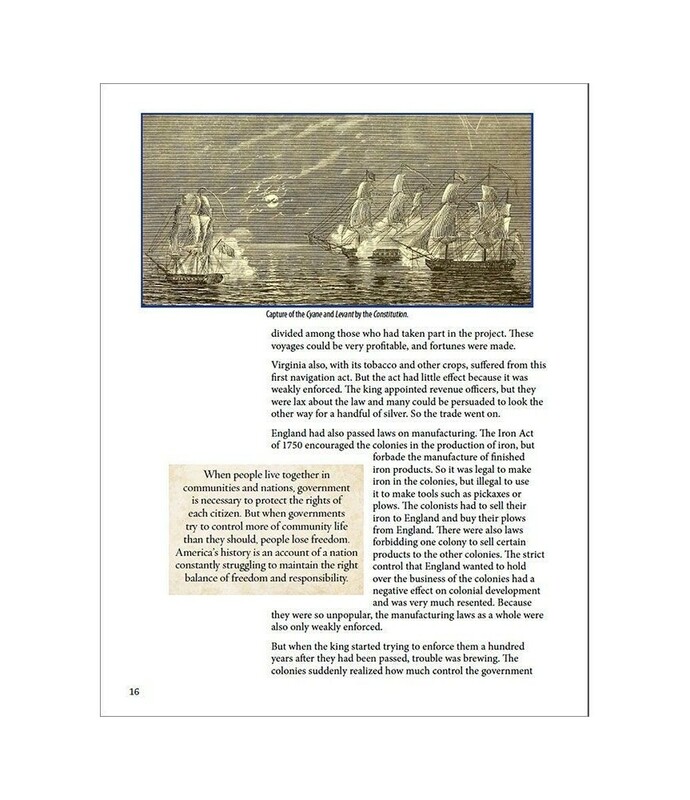 America’s Struggle to Become a Nation with The Timeline of the Revolution (Teacher Guide) is a comprehensive study of the history of America’s struggle to become a free nation for your 4th-6th grade students. This 36 week course is broken down into easy to manage lessons that include; reading, vocabulary, worksheets, quarterly quizzes and activities. You can choose either a five-day or four-day plan. The Teacher Guide is filled with everything you need. The worksheets and pages are perforated and three-hole punched so that you can tear them out for easy use. Suggested daily schedules include space to record student scores and completion dates. 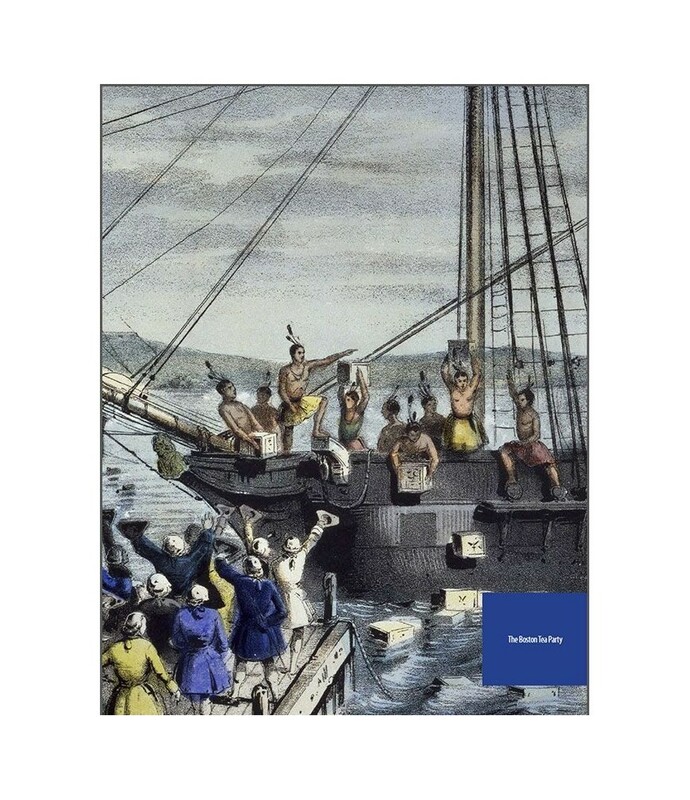 History reading selections are clearly outlined on the top of each lesson and come from the full color text – America’s Struggle to Become a Nation. 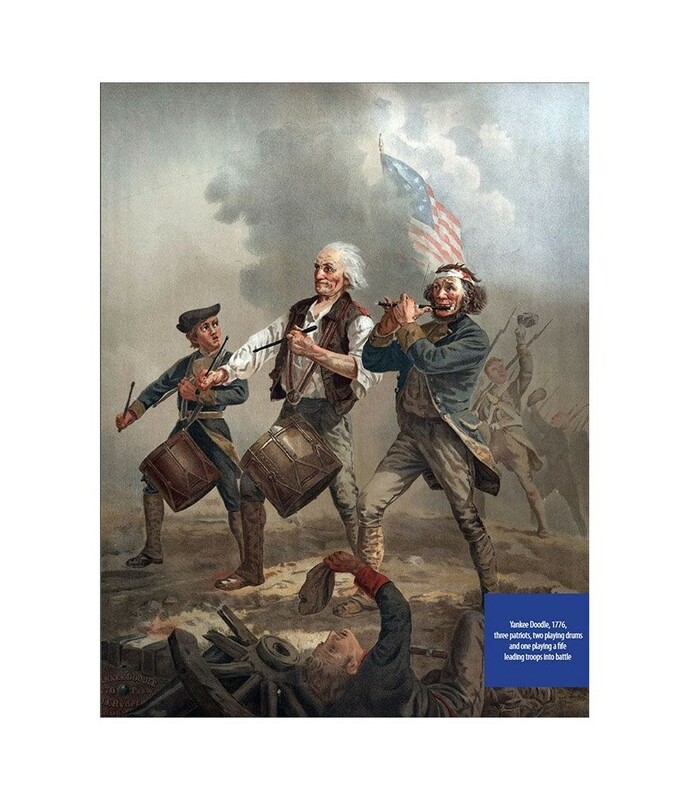 The Teacher Guide includes Patriotic Song Lyrics (and the stories behind the song) as well as a full timeline of events leading to the Revolution. Answer keys for worksheet and quizzes are right there for easy reference. Additional recommended resources are listed for further investigation. The main text is a 384 page, softcover book. 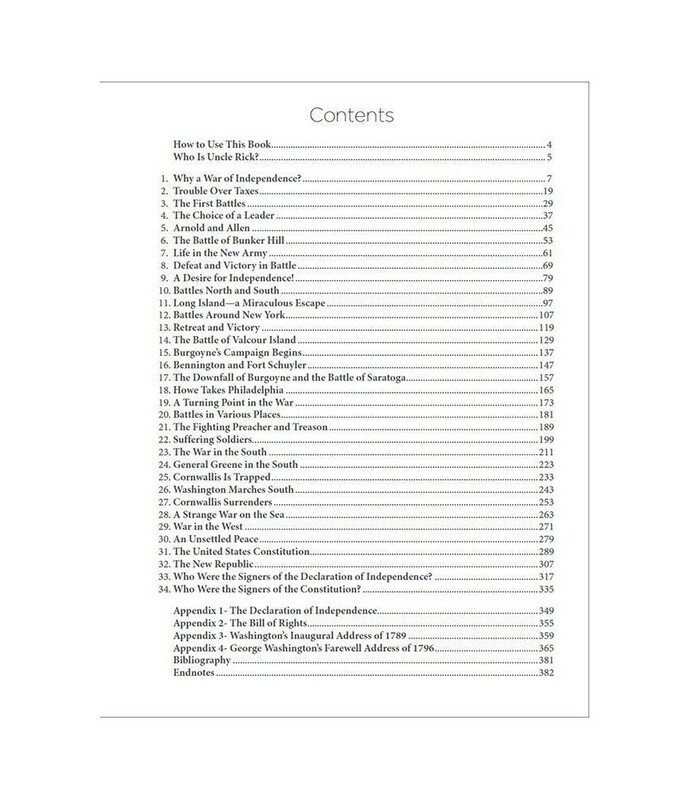 The 34 chapters are divided into three reading sections each, and is considered a full school year history course. One unique feature of this program is the recommended audio selections available at UncleRickAudios.com. Uncle Rick is a storyteller, and his audios are recordings of books about America’s Godly heritage. You can use these to bring the stories to life, and to take the learning with you on the go. A key learning component is the Student Journal. This is a place for your student to write in after they read each chapter. They pretend they are a child living at the time of the Revolutionary War and “journal” what they have just read about from that perspective. 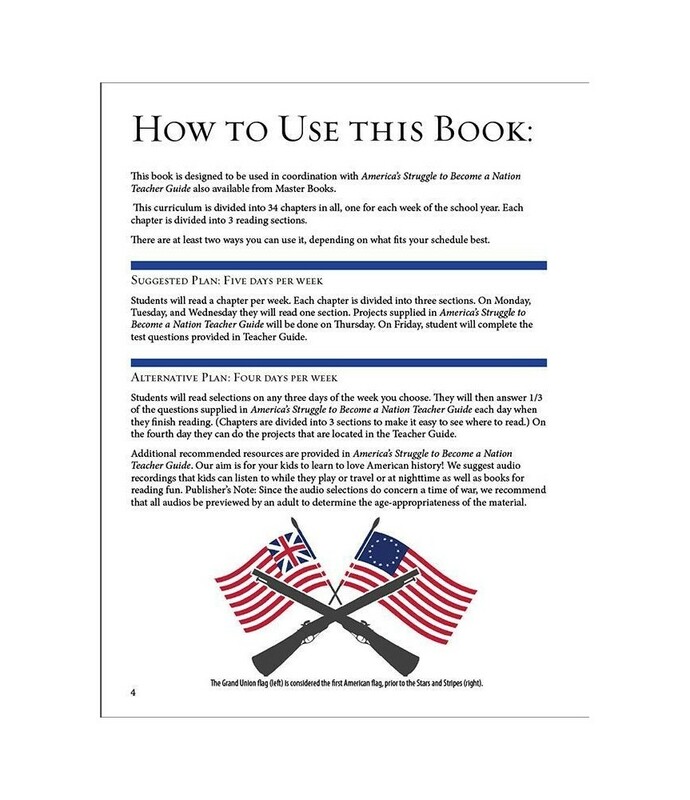 The worksheet pages offer Journal Entry suggestions for each chapter. Additional hands-on projects and activities are included for each chapter as well. From making your own flour fort (with M & M’s!) to memorizing the Preamble to the Constitution – these activities are designed to bring history to life for your student. We have been enjoying this course tremendously. My elementary students are easily able to read and complete the daily assignments independently, but this is too good not to join them! Woven throughout is the focus on America’s Christian heritage. Sidebars introduce great Americans and interesting facts. Scripture is quoted throughout. This is a beautiful telling of our country’s history and heritage. We have enjoyed the art and illustrations along with our reading. 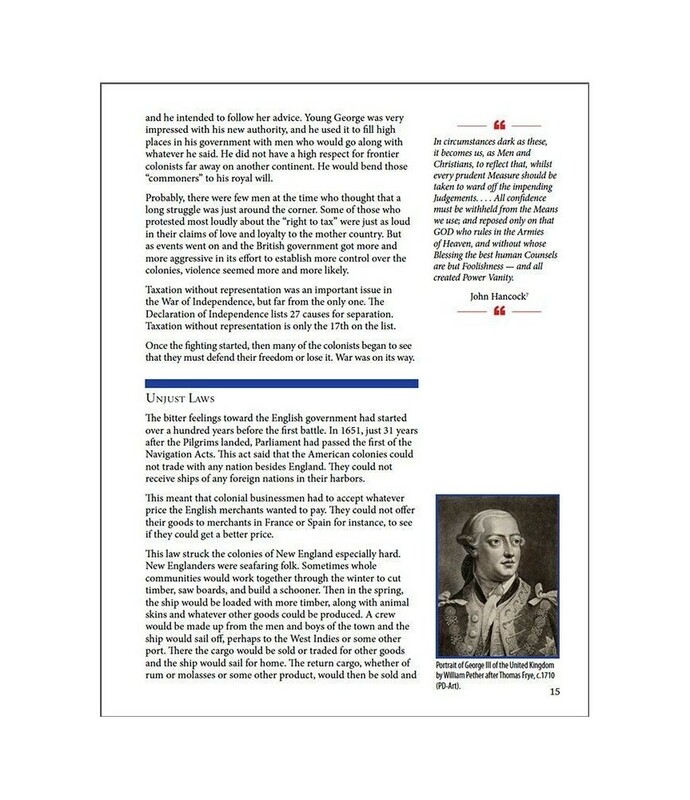 Some of our favorite chapters featured short introductions to each of the signers of the Declaration of Independence and the signers of the Constitution, what inspiring men they were! 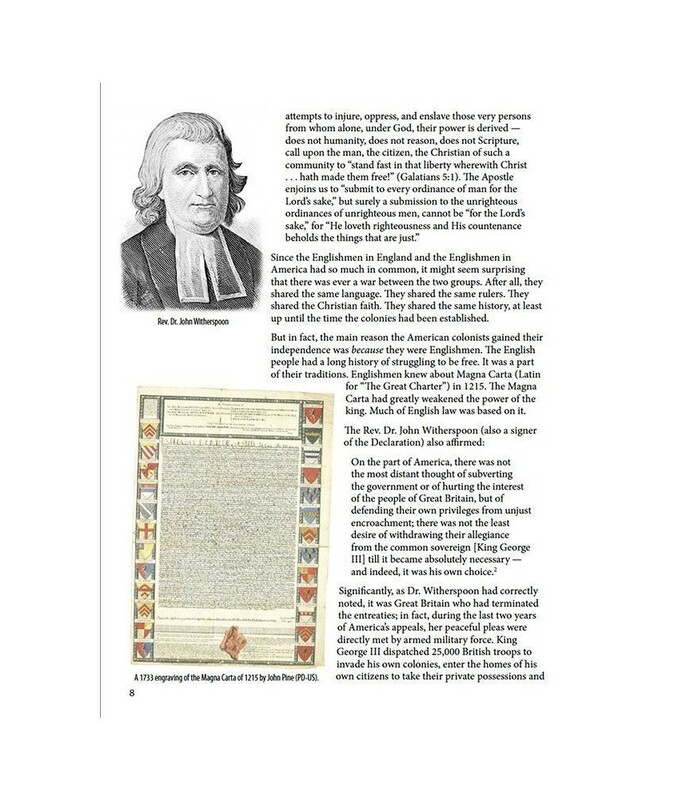 The Appendix includes four primary documents of our nation; The Declaration of Independence, The Bill of Rights, Washington’s Inaugural Address of 1789 and George Washington’s Farewell Address of 1796. This is a rich study to share together as a family. 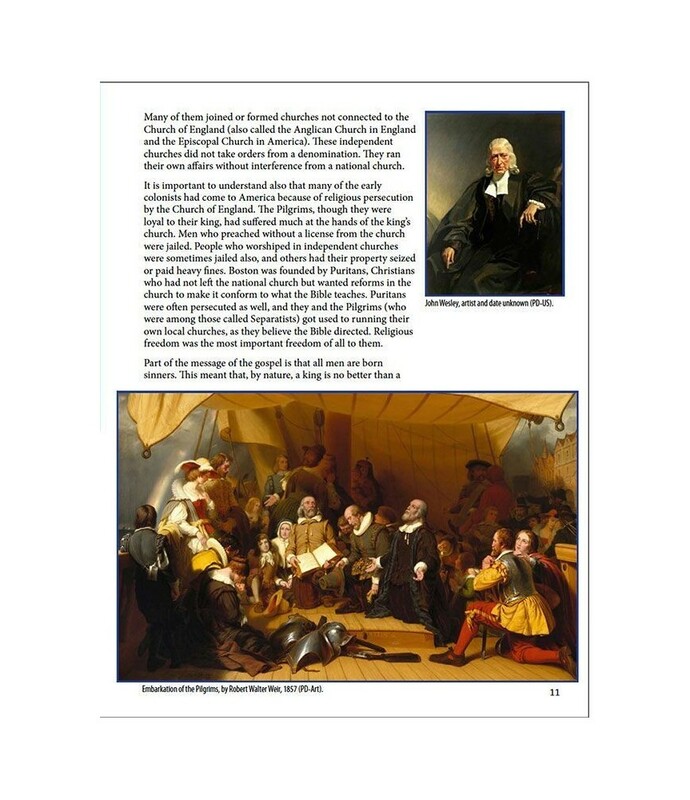 Are you looking for a simple way to teach history to your 4th-6th graders this year? I know I am overwhelmed every year as I constantly bounce around trying to find a curriculum that I love. 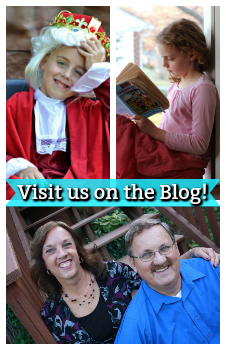 Some years I think I've got it and then our homeschool evolves, my children's interests change and suddenly I am looking for something that will meet our ever-changing needs. This year it was all about simplifying. 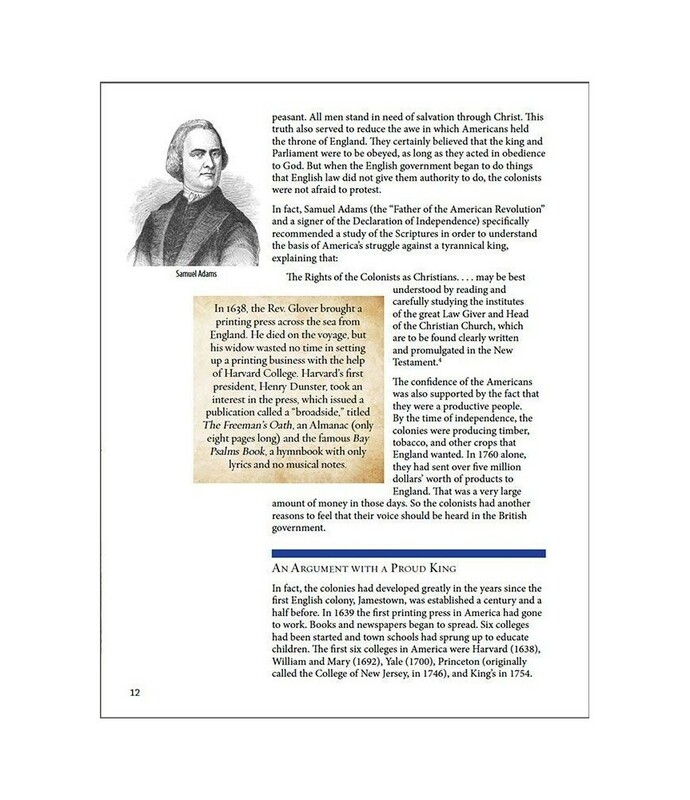 If you too are looking to simplify your homeschool then this new American History program published by Master Books may be just what you are looking for! 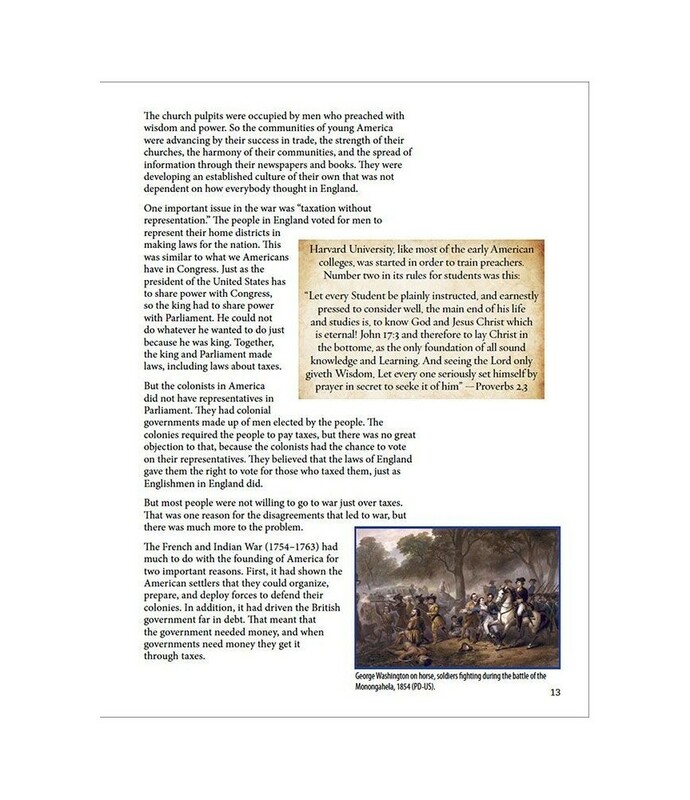 The new Timelines of the Revolution series is a 2-part set, The Fight for Freedom, Biographies of the American Revolution and America's Struggle to Become a Nation, Timeline of the Revolution. I was given America's Struggle to Become a Nation with coordinated teacher guide to review and I'm excited to tell you all about it! 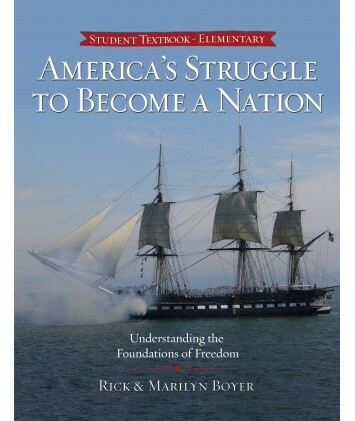 This new series, written by Rick & Marilyn Boyer of CharacterConcepts.com, helps students from grades 4 - 6 understand how our nation came to be. 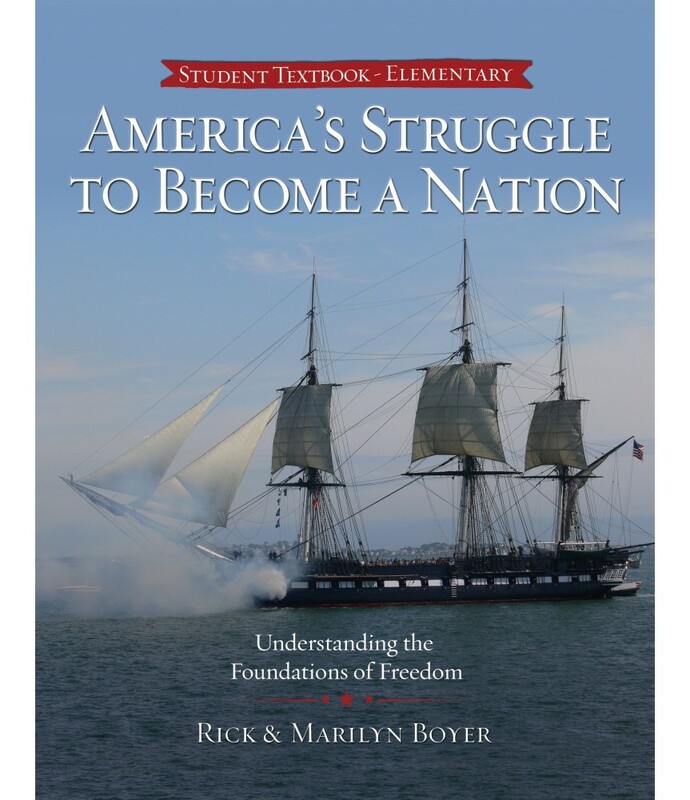 Staunch patriots, Rick & Marilyn present American History from a Godly perspective and really help children understand the blessings of liberty and the importance of not just remembering, but treasuring, our heritage. These 2 books are all you need to set students on the path of patriotism and a love of American history! 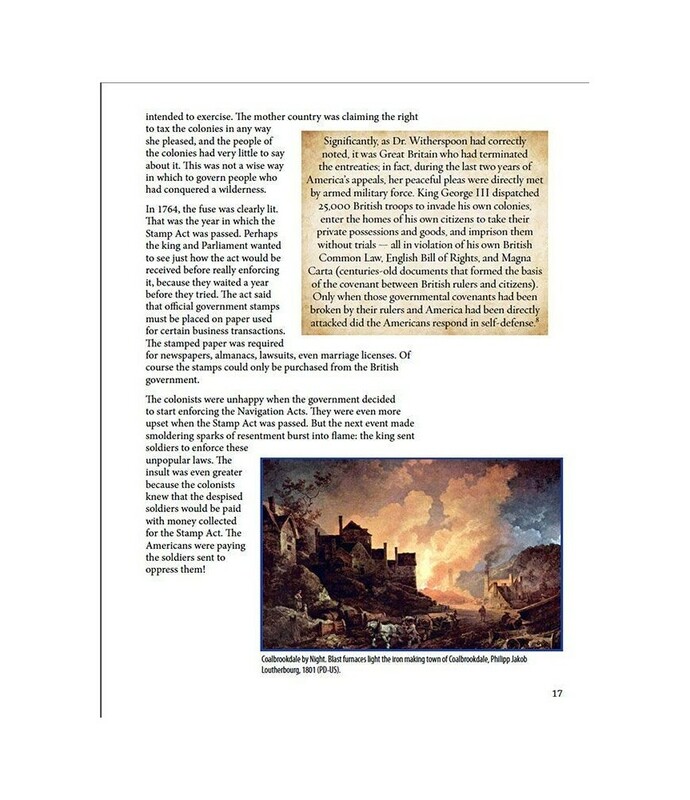 The text contains 34 chapters, one for each week of the school year. Each chapter is divided into 3 separate reading sections creating easy places to divide up the work through your week. As you can see in the Teacher Guide, the recommended schedule is a five day per week plan, but this program lends itself to flexibility and can be used as a 4 day plan as well. Each section includes a question/answer worksheet. -First of all the pictures are ah-mazing! The full color illustrations throughout the book are beautiful! -The Teachers Guide makes is super easy to figure out what each daily assignment is. Box-checkers that we are, we love a guide that lets us check something off. 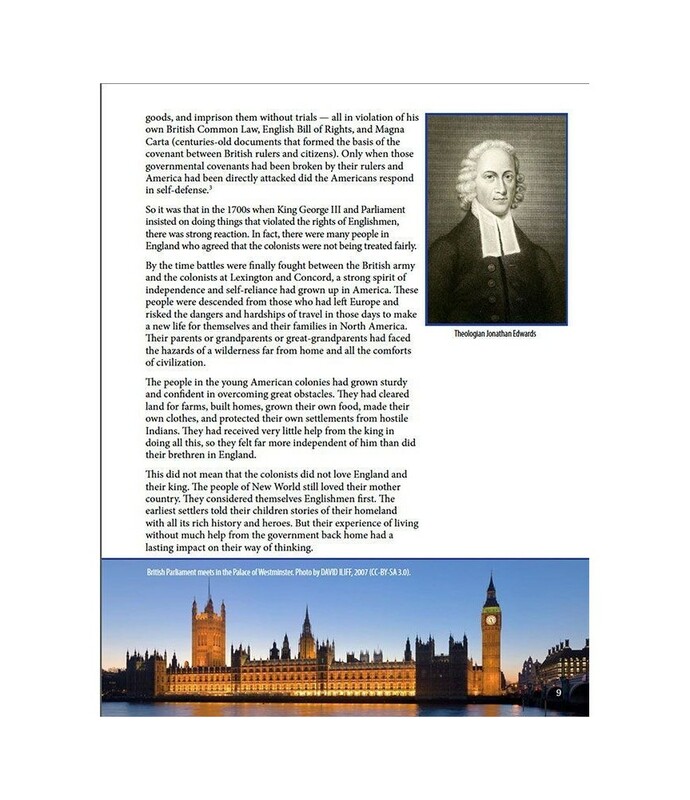 The teachers guide also allows for inputing and tracking grades if your homeschool requires that. -Lengthy quotes dotted throughout the book serve as source documents, which is something that is challenging to find in a homeschool curriculum for children this age. -Lessons are bite-sized allowing for great flexibility and holding your child's attention. -Quarterly and bonus quizzes are located in the back of the teacher guide for your convenience. This is a handy tool that can even be used orally to check for understanding. -One of our favorite parts - each chapter includes a couple of projects to complete. For example: memory work selections (like the pledge of allegiance), journal entries, designing posters, writing newspaper articles, building a fort, and research opportunities. -Wait, I changed my mind, I think maybe this is our favorite part: Uncle Rick stories are punctuated throughout the text. 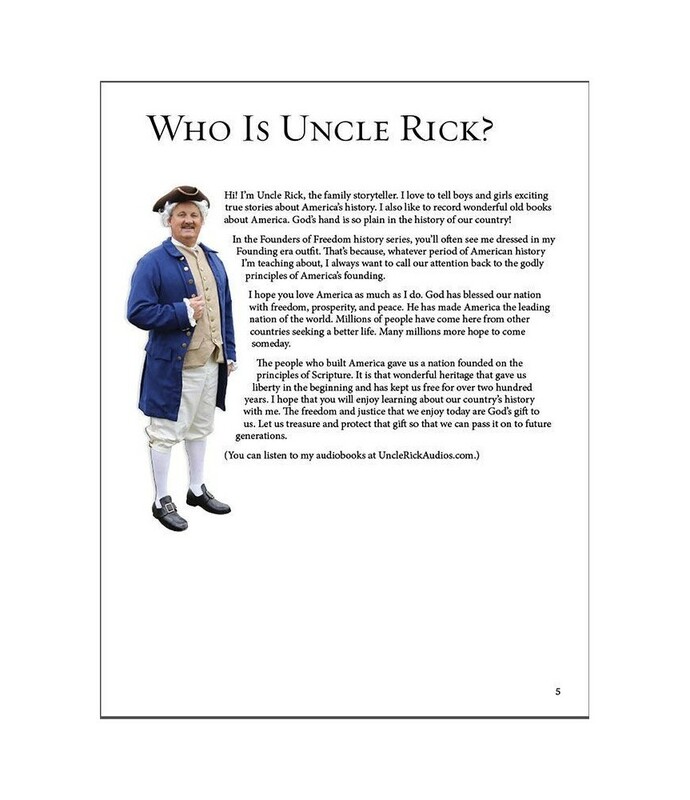 And many of you already know how I feel about Uncle Rick, but if you need a refresher you can read all about the "this is my Uncle Rick too" moment here! -The curriculum is designed for grades 4-6 but my 5th grade daughter did struggle to understand the meaty concepts without help so I believe that a parent or teacher will need to treat this book as a read-aloud for students who are not strong and motivated readers. 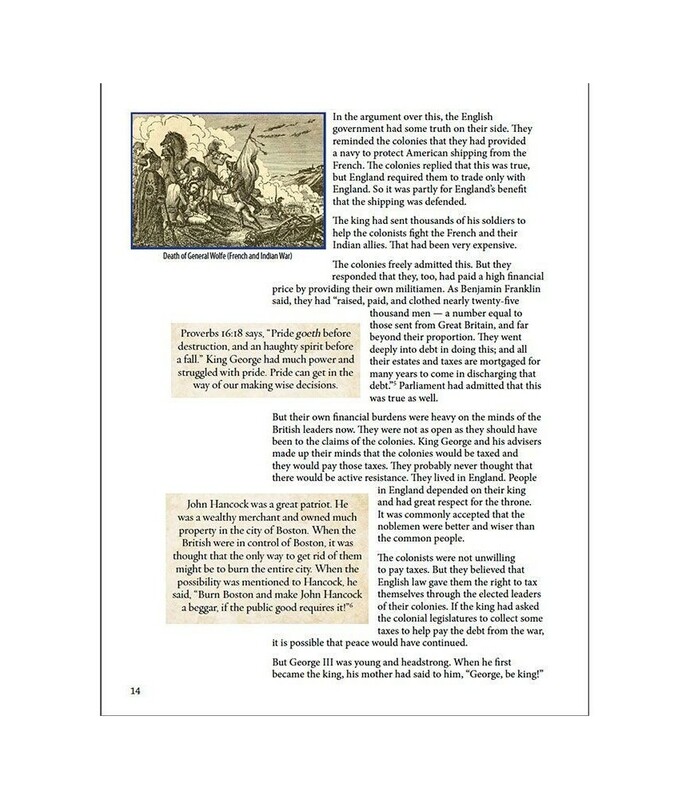 This works great for us since we do many subjects as read-togethers still.Master books offers .pdf download samples of both for you to read over before deciding. We really enjoyed reviewing this product and I plan to keep it and use it for next year when we begin our studies in American History! Check our more products from Rick & Marilyn Boyer by visiting their website at CharacterConcepts.com! 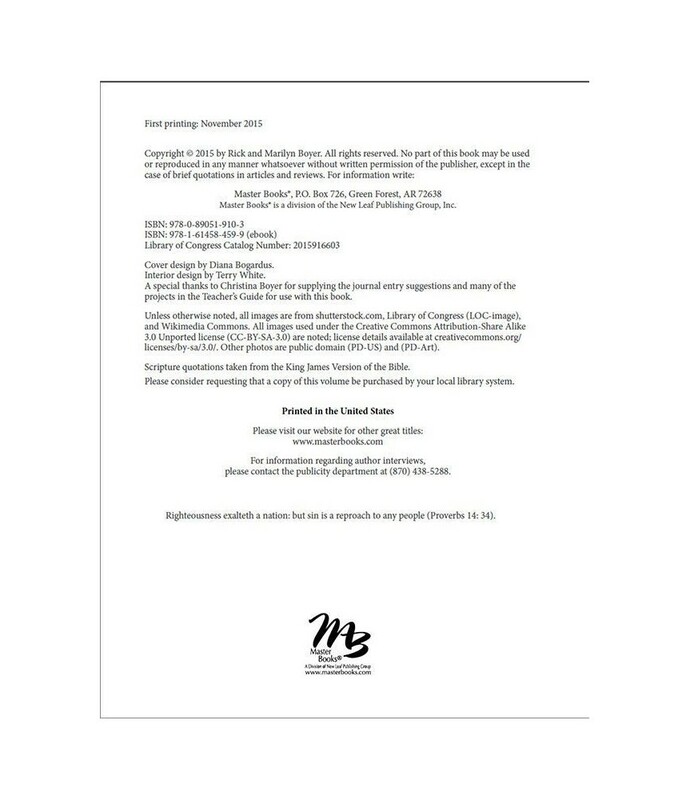 Disclaimer: Thank you so much to Rick & Marilyn Boyer and MasterBooks for the wonderful opportunity. I was given this product free of charge in exchange for an honest review. All opinions expressed here are my very own. Thank you so much for "swinging by!"